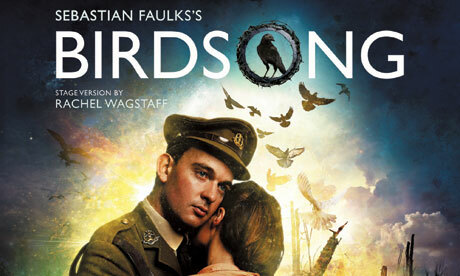 Rachel Wagstaff’s stage adaptation of the Sebastian Faulks novel yields an intelligent and stirring production, making the point that the First World War is now only knowable to us through secondary sources. The territory is familiar to us from poetry, literature and film. R C Sheriff’s classic play Journey’s End springs immediately to mind, and also Blackadder Goes Forth with its depiction of men of all classes thrown together in the trenches. Wagstaff’s script takes us back and forwards in time. We begin in 1916 when the war is deeply entrenched (sorry) in France. The men are cheery – given the title of the play, you might say ‘chirpy’ – singing music hall songs and repeating well-worn patter to keep up their morale. Enter cold fish of a commanding officer, Lieutenant Stephen Wraysford. Distant and aloof, he has a habit of slicing rats open in order to read the future in their entrails. He excuses a hard-working sapper from a court martial, setting in motion the chain of events that will bind these two men together until death does them part. It is Wraysford’s story we follow back and forth from scene to scene. Sent to France to work with a factory owner, he embarks on an affair with said factory owner’s wife, a holiday fling that increases in magnitude with the advent of war in Europe. Sarah Jayne Dunn (Mandy off of Hollyoaks) is elegant and pained as the wife, struggling to keep a lid on her emotions. Malcolm James is imperious as her abusive husband –you can see why she’d stray. The mood is leavened by Berard – Arthur Bostrom in fine fettle; inevitably, when he starts to speak in his French accent, you are reminded of his turn as the language-mangling gendarme in ‘Allo, ‘Allo! but this image soon fades. Charlie G Hawkins is energetic and powerful as young recruit Tipper; his snivelling and sobbing from fear before the men go ‘over the top’ is heart-wrenching. Victoria Spearing’s set – a bombed-out ruin of a building – serves for every scene: the trench, the home of Wraysford’s French hosts, the tunnels dug by the sappers. The action flows from one to the next seamlessly as the cast bring on and take off chairs and tables and so on, flitting across the stage like ghosts in Wraysford’s memory, his past life in rubble and ruins. This all works very well but I can’t help thinking I would like to see more differentiation in Wraysford himself. You quickly acclimatise to the fact that he’s going to appear in his army uniform even in the pre-war scenes but Jonathan Smith, although indicating through physical attitudes the change of time, place and circumstance, could do with extending his range of vocal choices; it seems as though he addresses everyone in the aloof and strident tones of the officer he becomes, even the supposed love of his life. I wanted to see more of a change in him on an emotional level. As sapper Jack Firebrace, Tim Treloar provides the backbone of the show, playing the full gamut of emotions with truth and subtlety. We feel the loss of his ailing son back home. We sense his attachment to his trench-mate Arthur. Through him we see what the war does to decent men. Through Wraysford we see a man blighted by love rather than war – the war just compounds the damage done. Unfortunately, he doesn’t quite match the presence of Firebrace. More time is needed for us to invest in this man before we meet him as the cold and distant lieutenant. Director Alastair Whatley has a powerful production on his hands. There are some striking moments: the love-making scene has a whiff of contemporary dance to it, stylising the passion as we romanticise our own endeavours in that sphere! The scenes in the tunnels and trenches with their bangs. booms and flashes are evocative and frightening. The device of characters narrating their letters to and from home serves to give us multiple viewpoints of the situation and to individualise the people involved. It’s a shame we feel more engaged with these minor, subsidiary characters than the leading man.